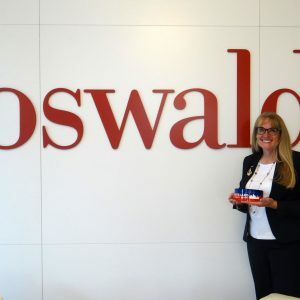 Coast Guard Rear Admiral June Ryan (retired) is the recipient of the Oswald Companies President’s Award from the Cleveland Leadership Center in recognition of her civic achievement and involvement with Leadership Cleveland. The award is given each year to the most recent elected Leadership Cleveland class president. Ryan, president of the Leadership Cleveland Class of 2017, was given the award at the Cleveland Leadership Center Board of Trustees meeting on September 26, 2017. Oswald CEO Robert J. Klonk (Leadership Cleveland 2016), who is a CLC Board member, presented the award. CLC President and CEO Marianne Crosley said the recognition sets the course for ongoing service by the class presidents and their classmates, noting that Ryan, who will officially retire from the Coast Guard on September 30, is fully and deeply committed to Cleveland and to keeping her classmates engaged. Ryan had been with the Coast Guard for 35 years and retired to remain in Cleveland rather than risk being posted elsewhere at the conclusion of her term overseeing U.S. waters of the Great Lakes and Saint Lawrence Seaway. “My family has been bitten by the Cleveland bug, and they don’t want to leave,” she told reporters in July. 2016: Annemarie Grassi, CEO of Open Doors Academy. 2015: Melanie Shakarian, Director of Development & Communication at the Legal Aid Society of Cleveland. 2014: Mayor Joseph M. Cicero former Lyndhurst mayor and Ndeda N. Letson, VP Ohio & Michigan Community Development at Citizens Bank. 2013: Stuart Rosenberg, Group Administration Leader at Westfield.